Many low-carbohydrate dieters utilize ketosis strips as a way to determine whether their body is reacting to the low-carb or low glycemic diet appropriately. The small strips test urine and measure whether or not you have achieved ketosis. The father of the low-carbohydrate diet, Dr. Robert Atkins, brought the concept of ketosis to the popular consciousness when he penned his first book, Dr. Atkins Diet Revolution, in 1972. At the time, Dr. Atkins suggested that in the process of a low-carbohydrate diet, the body achieves a process known as ketosis. When you are in ketosis, your body is burning stored fat as its primary source of fuel, causing ketones to enter your urine. 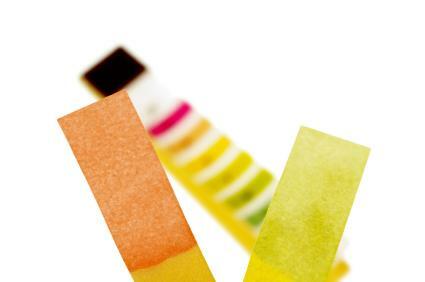 Ketosis strips allow you to measure whether you are in ketosis. If you aren't in ketosis when low-carbohydrate or semi-low-carbohydrate dieting, then you may need to reduce carbohydrates further or look for hidden sugars in the foods you're eating. How Do I Speed Up Ketosis? Many people fear ketosis is a dangerous physical state. It isn't. It merely means your body is utilizing its own fat as its primary source of fuel. The result is weight loss. Ketosis strips, also known as Ketostix, are small plastic strips that have a chemically-reactive indicator pad on the tip. You use the strips to test your urine to determine whether you are in ketosis. Using ketosis strips is relatively easy. You can either hold it in the flow of urine and take a reading after about 15 seconds, or urinate into a container and then dip the strip in it. Use the strips in the morning, when urine is most concentrated. If you use ketosis strips following exercise or when you've been drinking a lot of fluids, then the pad on the end may not change color and give you a false negative. If you are in ketosis the indicator pad will change color to some shade of pink or purple. The ketosis strips box typically has some kind of a comparative chart on it so you can determine what your reading means. Typically, if the pad changes color, then you are in ketosis. Many people believe the darker purple their strip, the more weight they will lose. This is a myth. Any level of ketosis means you are burning fat as fuel. If you are at the darkest purple, you are most likely dehydrated. Since ketosis strips are quite reactive to moisture in the environment, it is best to keep them in a tightly sealed container and only take one out when you are ready to use it. Also, make sure your fingers are dry when you first handle the strips, and observe the expiration date, after which the Ketostix may no longer yield valid results. Ketosis strips can be found anywhere diabetes and low-carbohydrate diet supplies are sold. Check with your local drugstore in their diabetes supply section. 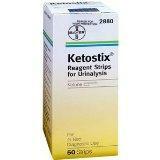 Many health food stores that cater to low-carbohydrate dieters may also stock Ketostix. Look for labels that say "Ketone Test Strips," "Ketosis Indicators," or similar terminology. If you are new to low-carbohydrate dieting and you'd like to be sure that you are doing it right, ketosis strips can help show the plan is working. As such, they provide a valuable tool for low-carb weight loss.